It had probably been a good two decades since I last saw this, and about the only thing I remembered with clarity was the death by icicle. Having watched it again, that makes sense. For, despite having most of the same pieces in place as the original, it doesn’t come anywhere close. Sure, it’s Christmas Eve once more. 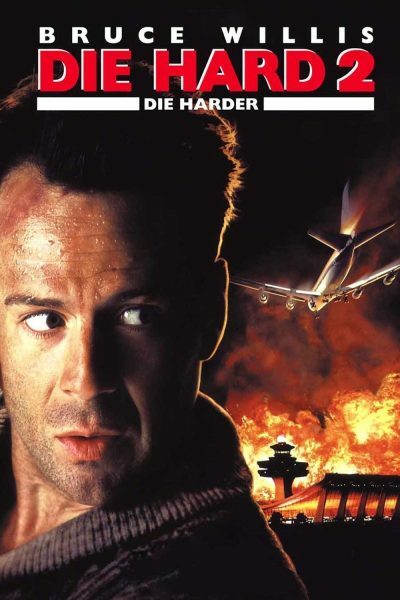 You’ve got John McClane (Willis), again running round a confined space – here, a snowbound airport – in pursuit of terrorists who are threatening his wife (Bedelia). There’s a useless police chief (Franz), who interferes more than he helps, and the same is still largely true of the media. It’s even based on a largely-forgotten novel, Walter Wager’s 58 Minutes. So why are the results so underwhelming? I largely blame Sadler, who plays Colonel Stuart. He is the closest the film can muster to a villain, being in charge of the rogue merc outfit who take over Washington’s Dulles airport. This is in order to rescue General Ramon Esperanza, a Central American ruler being extradited to the US on drug charges [Iran-Contra is an obvious inspiration for this angle], though if you can’t come up with ten easier ways in which this could have been achieved, you’re not trying very hard. Sadler feels like a low-rent version of Dolph Lundgren, and his bland lack of charisma stands in sharp contrast to Alan Rickman. It’s hard to be sure whether the Colonel or the General is the villain here. Neither character is up to the mark. The main plus is Harlin, who does a solid enough job with the pieces, moving them around the board with brisk energy, and managing some effective sequences. The crash of the jet engineered by the terrorists is a disturbing highlight, not least because it’s piloted by a then largely-unknown Colm Meaney [one of the bit-part terrorists would similarly go on to greater success: Robert Patrick, who’d play the T-1000 in the following year’s Terminator 2] However, the greater reliance on CGI has not stood the test of time well, as the the top image illustrates. The ludicrous level of flight security seems especially anachronistic now. You will have to explain to your kids that, yes, there was a time when you could take a stun-gun onto a plane in your hand-luggage. In the film’s defense, it was a huge success, outperforming the original at the box-office, both home and overseas – worldwide, it took about 70% more. It likely marked the high-water mark of Harlin’s career: two weeks later, The Adventures of Ford Fairlane was released, netting him the first of his four Golden Raspberry nominations. 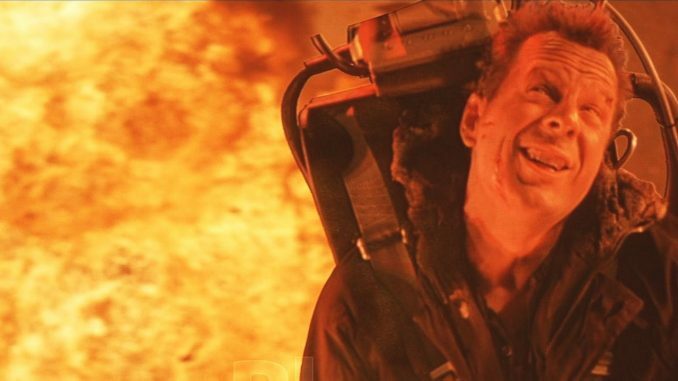 But it’s not just me who views Die Hard 2 as a pale imitation of the original. It was much less well-received by critics (except, oddly, Roger Ebert) and is rated more than a full point lower on the IMDb. I’d say even that was being very generous: it probably won’t be long before that death by icicle is, once again, the only thing I remember about it.